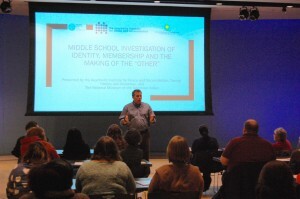 On Thursday, March 3 and on Friday, March 4, the Auschwitz Institute for Peace and Reconciliation (AIPR) held a two-part workshop event for Middle School and High School educators in the New York area. The workshop, carried out in partnership with the National Museum of the American Indian, Facing History and Ourselves, and the National September 11 Memorial & Museum, focused on the themes of identity, membership and the making of the “Other”. Led by Dr. James Waller, AIPR’s Director of Academic Programs and Cohen Professor of Holocaust and Genocide Studies at Keene State College, the program encouraged participating teachers to explore the role that identity plays in how people relate to each other and the ways in which group-based identity can lead to social divisions and conflict within classrooms, communities, regions, and countries. On Thursday, middle school teachers were invited to the National Museum of the American Indian to discuss the highlighted themes of identity, membership, and the making of the “Other”. The day’s specific focus centered on the issue of Native American sports mascots. The program began with introductory remarks by Mr. John Haworth, Senior Executive of the National Museum of the American Indian, Dr. Tibi Galis, AIPR’s Executive Director, and Mr. David Schwartz, a Senior Program Associate at Facing History and Ourselves. Throughout the day, Dr. Waller delivered bespoke interactive modules on the importance of social identity and the issue of Native American sports mascots as a contemporary identity issue. 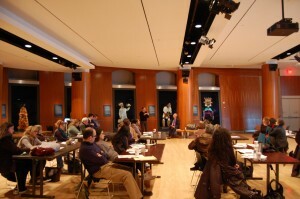 In the latter module, participants were presented with information regarding the contemporary state of the controversy, notable efforts to remove and to preserve these mascots, and examples of techniques for integrating the topic into participants’ classroom work and discussions. Additionally, Mr. David Schwartz delivered an interactive pedagogical exercise on “The Individual in Society”, which stressed important considerations of self-identity in relation to our broader communities. Following the afternoon curricular modules, participants were given a guided tour of the museum and presented with certificates of completion. On the following day, a group of high-school educators were invited to the National September 11 Memorial & Museum for the second half of the workshop series. 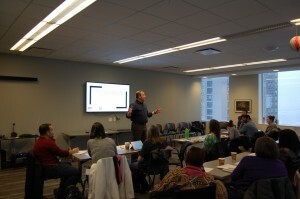 In similar fashion to the previous day’s focus on Native American sports mascots, Friday’s participants were given an opportunity to contextualize discussions on the workshop’s primary themes of identity, membership, and the making of the “Other” within the public discourse surrounding immigration and terrorism. Mr. Haworth, Dr. Waller, Dr. Galis, and Mr. Schwartz were joined by Ms. Jan Ramirez, Vice President of Collections & Chief Curator at the National September 11 Museum & Memorial, in delivering the day’s opening remarks. In addition to Dr. Waller’s interactive module on social identity and Mr. Schwartz’s exercise on “The Individual in Society”, Dr. Waller presented a module on contemporary identity issues entitled “’Othering’ in Public Discourse Around Immigration and Terrorism”. This module analyzed the psychological construction of the “Other” and ways in which Othering has manifested in contemporary and historical society. Participants were challenged to consider these issues in the context of their own classrooms and to create innovative ways of addressing them with their students. 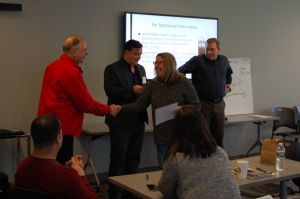 The day concluded with a presentation of certificates of completion and an opportunity for participants to explore the September 11 Memorial and Museum, following an introductory presentation by a member of the Museum’s staff.